Solar Pool Heater. Before you buy a solar swimming pool heater - read this. A solar swimming pool heater is a great way to get your feet wet with solar. Make a splash in the neighborhood by installing a solar heater for your swimming pool. Hello summer fun! A Solar Pool Heater means a longer swimming season at half the cost. Buy one ready made or try our DIY pool heater project and start saving with a solar swimming pool heater. Of all the systems that are more practical when solar powered, swimming pools top the list. Conventional filtration and heating of swimming pools are costly draws on your energy bill and solar can help. With a solar pool heater you can have more fun for less money. Many pool owners happily report that swimming pool season is extended by as many as 3 months after a solar pump and heater have been installed. Solar Collector ~ Either glazed or unglazed, solar collectors heat pool water as it is circulated through them. Strainer ~ Removes larger debris before filtering. Filter ~ Filters are required in any swimming pool and serve to keep the water clean and free of debris. Flow Control Valve ~ Either manual or automatic, the flow control valve allows you to bypass the collectors when heating isn't necessary and to divert the pool water through the systems you choose (heater, fliter, AC). Extends swimming season... by months and at no extra cost. Reduces use of non renewable energies. Saves money... lots of money. Solar components typically last longer than AC. Space for solar collector ~ You'll need an area where the collector can be exposed to southern sun (or close to it) for 5 or 6 hours per day, preferably mid day sun. Sometimes the roof works for the purpose and sometimes it doesn't. Possibly you can build a platform at the best angle for summer sun. By enclosing the area beneath the platform you can turn it into a pool storage shed. This works particularly well in the north or south where the panels will be angled more sharply. Cover the pool ~ 95% of the heat loss of pool water occurs at the surface through evaporation, conduction and radiation, particularly at night and on chilly days. A pool cover not only reduces the cost of the system you'll require but keeps the heat where you want it. A pool cover will normally pay for itself within the first year and is a worthy addition to your pool care regimen. Payback in 2 to 6 years ~ Payback time depends on cost of local utilities and on the cost of the system. In any case, once the system is paid for it continues to work for several years at no additional cost to you. Pool water can also be cooled by circulating the water through the collector at night when pool temperatures rise too high in the day. Pool safety is always a top priority. Your municipality probably has by-laws in place that regulate pool safety. Even if they don't, pool safety is peace of mind. Ensure that access to your pool is limited by a fence and gate. Consult with local authorities regarding codes, regulations and by-laws at your location. Some states require that the work be done by licensed professionals. Heres a DIY solar pool heater project and a video of a super simple solar pool heater project. 2 different concepts to get you started. Spool of UV resistant, flexible hose, the same size (or close) as the inside diameter of your pool water lines. Hose clamps, and lots of soft ties or zipties. Spray paint, flat black (we like BBQ paint for it's heat resistance). 1/4 inch plywood if you'll be mounting on a solid flat surface. 1/2 inch (or thicker) if not. At least 4 feet by 4 feet, 6X6 is not too big. Insulation ~ Insulating the back of the structure prevents the loss of heat. Styrofoam, fiberglass, expanding spray foam, even straw or crumpled newspaper can be used to insulate your solar pool heater and prevent heat from being drawn into the ground or concrete. Spray paint one side of the plywood with the flat black paint and let it dry. Make a circle in the center of the black side of the board with the hose, as tightly as you can without the hose kinking or pinching and secure in place. Continue winding the hose snugly around itself in ever widening circles keeping the hose flat against the black board and each circle touching the last. Secure as needed. Both ends of the hose must remain visible and accessible for fittings to be applied. Once you have your solar pool heater secured to the board, attach fittings to allow water to be diverted through the hose. Your solar swimming pool heater should be attached to the swimming pool water flow after the filtration system or immediately before the water is discharged into the pool. Water heating occurs after filtration takes place because filters are not designed to function at high heat levels. Here's a great video. The simplest homemade solar water heater we've seen yet. Your finished solar pool heater will be fairly large and..well... not really pretty. Give some thought to where you can establish it where it'll get the sun it needs, be close to the pool and as out of sight as you can manage. Expect to pay $3,000 to $4,000 USD for the installed system. Payback (when the system has paid for itself) is between 2 and 6 years and once it's paid for a well maintained system will continue providing free energy for 5 to 15 years. There are many variables that determine the cost of a solar swimming pool system. They're discussed below under sizing. Your solar powered swimming pool pump should exchange 100% of the contents of your pool in a 24 hour period. Pool size and cycles per day. Is the pool covered when not in use. Size and type of filter and hoses. Pressure side cleaners require more pressure, in general, than suction side cleaners. The amount of pressure the cleaning equipment requires. Amount of useable sunlight available. Glazed collectors are a little more high tech than unglazed and are composed of more expensive materials (copper tubing and iron tempered glass) that make them a more costly choice.The iron-tempered glass sheet that covers the collector is referred to as glazing. Glazed solar collectors are really only required if you'll be running your pool year round in a cold climate or if you expect that temperatures will dip below freezing while the pool is functional. Unglazed collectors are made of inexpensive, heavy duty, UV resistant, rubber, plastic or PVC and do not need a glass cover. 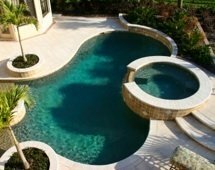 A good choice for a "summer only" pool, unglazed collectors work best in warm climates where temperatures don't go below freezing. The video and DIY pool heater project above are both unglazed collectors. Hybrid swimming pool systems are available that combine your gas or electric system with solar to reduce energy costs. Pool water can be directed to flow through a solar pool heater and then through a conventional pool heater if you choose.This type of solar swimming pool can be easier to size since the standard system will pick up where the solar system leaves off. How much experience do they have installing the type of system you've chosen? Do they offer a maintenance service for the solar pool heater? What are their warranty policies? Search licensing boards and BBB for any complaints. Unless you are very skilled at solar installations it's usually best to hire a professional to install any solar swimming pool system. Someone who has the tools and skills to perform a job is almost always capable of doing a job better, faster and with fewer problems than doing it yourself.